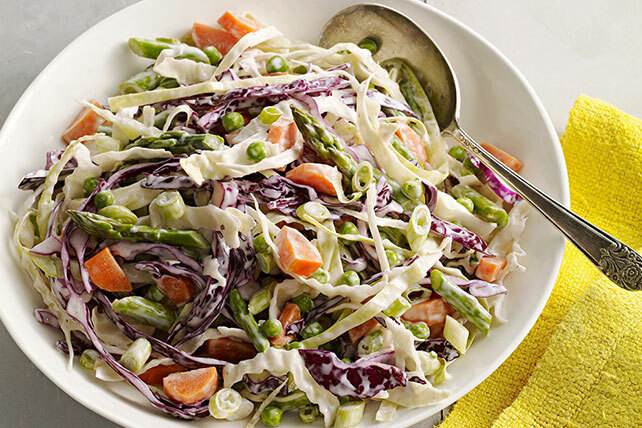 This crisp and colorful coleslaw isn't just cabbage and dressing; it gets its color from asparagus, carrots and peas! Microwave asparagus, carrots and water in large microwaveable bowl on HIGH 1-1/2 to 2 min. or until vegetables are crisp-tender; drain in colander. Rinse cooked vegetables under cold water 1 min. ; drain well. Return to bowl. For added color, prepare using a combination of shredded red and green cabbage. Substitute 1 pkg. (14 oz.) coleslaw blend (cabbage slaw mix) for the shredded cabbage.